Cobrir mais terreno e zip em torno dos pontos turísticos em um Tuk Tuk motorizado nesta excursão privada de 2 horas de Budapeste. Admire os monumentos da orla do Danúbio, classificados pela UNESCO, e o Bairro do Castelo de Buda, atravesse a ilha de Margaret e explore bairros como o Tabán e o Monte Gellért. 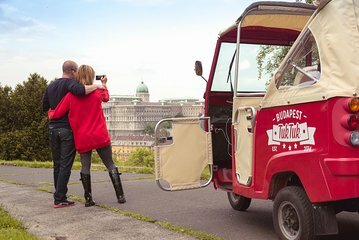 Very good private Tuk Tuk tour and recomended if everyone who need visit Budapeste. The driver is very good and explaned every detail for monumento and history for Hungary people. TuK Tuk is Tooo Fun! The best way to zip around town and get to know the lay of the land. Our driver was knowlegeable and ready to acommodate our every whim of where to go. We got to see everything and had a ball getting there! We had taken a couple of walking tours and Hop On/Hop Off bus tours and this was by far the best and most fun. Shout out to our student guide, Peter, who made it so much fun! This outfit is awesome. Their guides love this city and give a lively and fun presentation of it. Our booking was messed up and despite being full they made it work which we really appreciated. We had Barney and his cousin who's name also starts with a B and they were excellent. On our entire 18 day European journey - this tour stands out as the best thing we've done. Also, the tuk tuks are a fun way to wind through the city and get some fresh air! In my book it's a total must-do!!! Our party of 3 had 2 vehicles and 2 drivers. Both drivers, Peter and Zoltan, were professional and quite knowledgeable of Budapest. As such, they were able to bring to life the history of this beautiful city. Highly recommended for young and old. Dispite of the terrible bad weather we did the tour! The drivers were very helpful to drive us to the places we preferred. We stopped several times to take pictures. We had a lot of traffic jam and therefor the tour time was extended. Our driver was a bit late picking us up because of traffic. It was a superb ride on the day of our arrival. We got to walk around and know where we wanted to return the next day. Our driver was knowledgeable and amusing. He had blankets as it got colder around 17h00. This was one of the best experiences I have ever had. Myself and my partner both loved it. Saw the majority of Budapest and you're able to hop off to look around and grab some photos. Our driver Dan was very friendly, fun and knowledgable about the city.